Marvel Entertainment and Disney Interactive Media Group (DIMG) today announced that the first social game based on Marvel’s iconic characters, Marvel: Avengers Alliance, is now live on Facebook. Developed by Playdom, Marvel: Avengers Alliance features a tactical turn-based combat experience with dozens of familiar Marvel Super Heroes and Super Villains, setting a new standard of production value and interactivity in a social game. 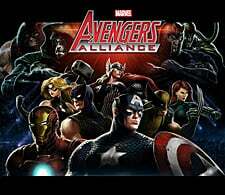 With dozens of the most iconic Marvel characters available at launch, Marvel: Avengers Alliance offers players a tactical turn-based combat experience unlike any other social game. Players will have the opportunity to recruit some of Marvel’s most notable characters, including Iron Man, Thor, Captain America, Hulk, Hawkeye, Black Widow and many others. Players can train their heroes to unlock unique abilities, and further customize abilities. Players can also square off against each other in player-versus-player combat, challenging their social graph to super-powered showdowns. Marvel: Avengers Alliance takes place in the wake of a galaxy-wide disaster, known as the Pulse, which exposes Manhattan to attacks by Marvel’s most deadly Super Villains. Players are recruited as an agent of S.H.I.E.L.D., the secret espionage and peace-keeping organization of the Marvel Universe, to assemble and lead teams of Super Heroes with a mission to keep New York City safe from the clutches of such enemies as Loki, Doctor Doom and Magneto, as well as sinister criminal organizations like Hydra and AIM. In the coming months, Marvel: Avengers Alliance will continue to expand with ongoing content releases. Players can look forward to new missions and storylines, additional Super Heroes, and upgraded abilities, plus new equipment, weapons, powers and costumes for unlock and purchase. Social gamers and Marvel fans can join S.H.I.E.L.D and begin the adventure immediately at Facebook.com/AvengersAlliance.